I know updates have taken a back seat this year solely due to the volume of work that keeps coming in but I couldn’t let this pair pass by without a post about them. 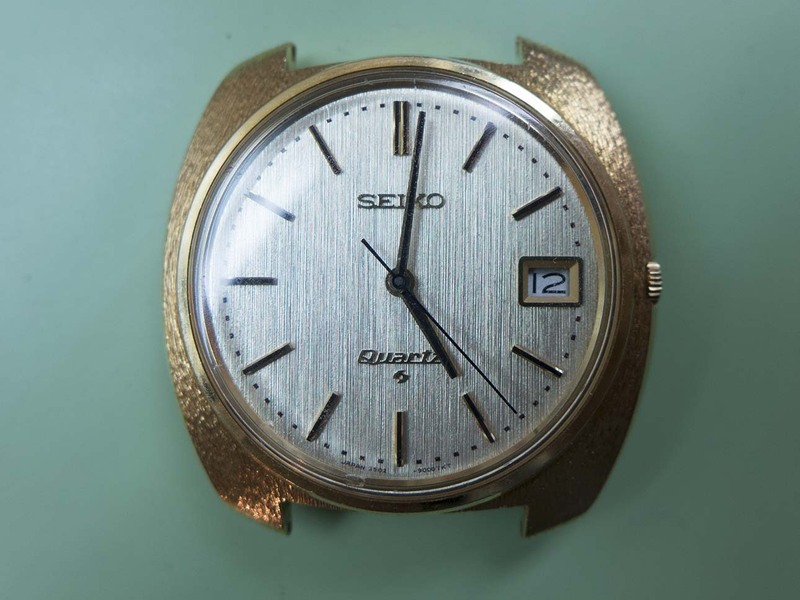 As most people with an interest in horological history will know, the world’s first quartz wristwatch was introduced on Dec 25th 1969 by Seiko. 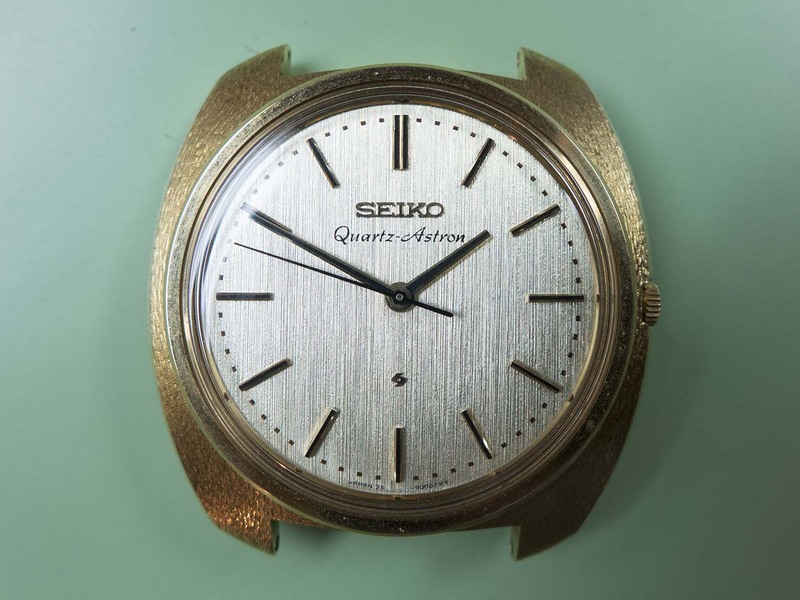 Called the “Astron” it was powered by Seiko’s 35a quartz movement which had been 10 years in development and was truly a revolution in wristwatch manufacture, in fact the quartz movement changed the face of wristwatch production forever and caused years of change and lets face it some very hard times for watch manufacturers around the rest of the world. 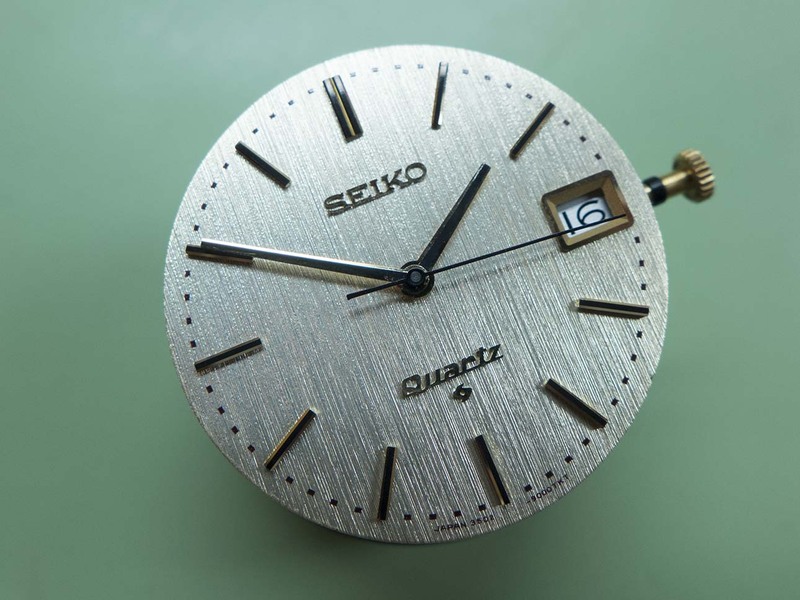 The 35a movement’s frequency was 8192 Hz, a quarter of the frequency of quartz oscillators today although the accuracy was still an impressive ±0.2 seconds per day or ±5 seconds per month. 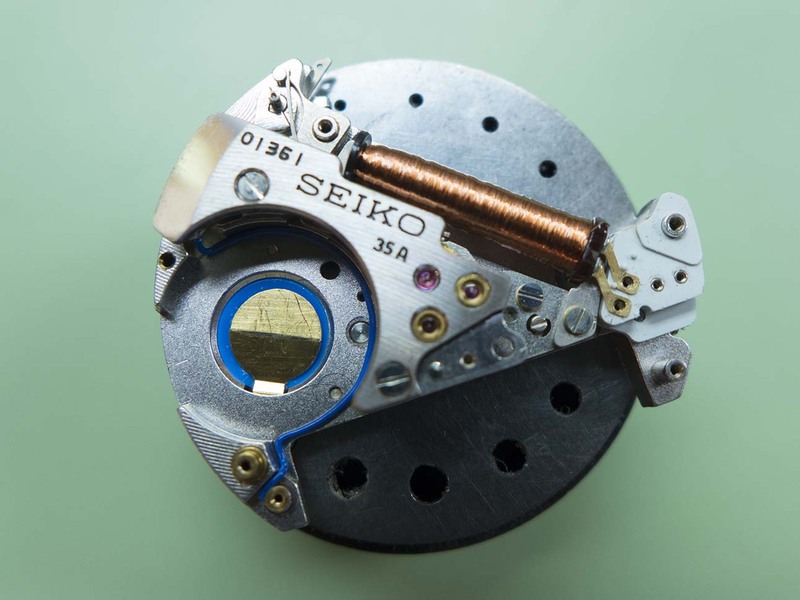 One of the major features was its hybrid integrated circuit innovation which consumed far less power than transistors of the time. 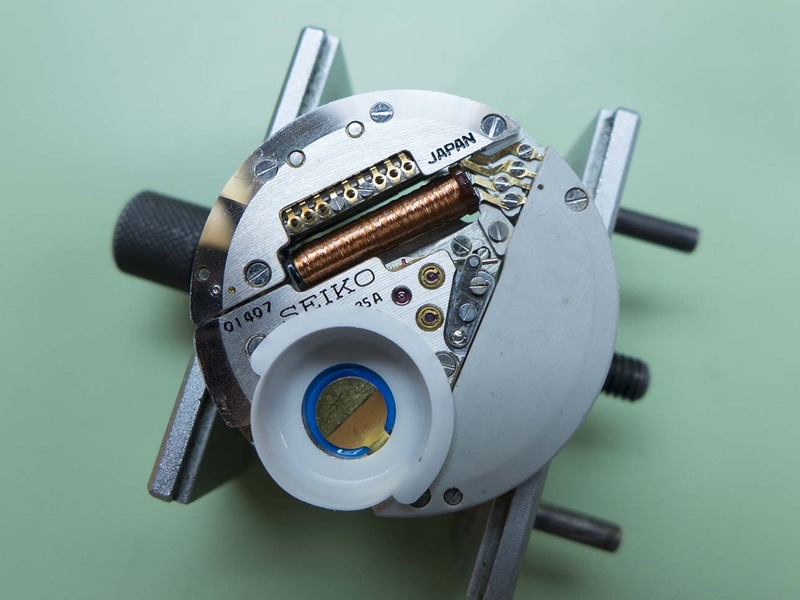 Another breakthrough was the step motion seconds hand made possible by developing a miniature open step motor, this innovation was adopted by other manufactures of quartz watches later on. 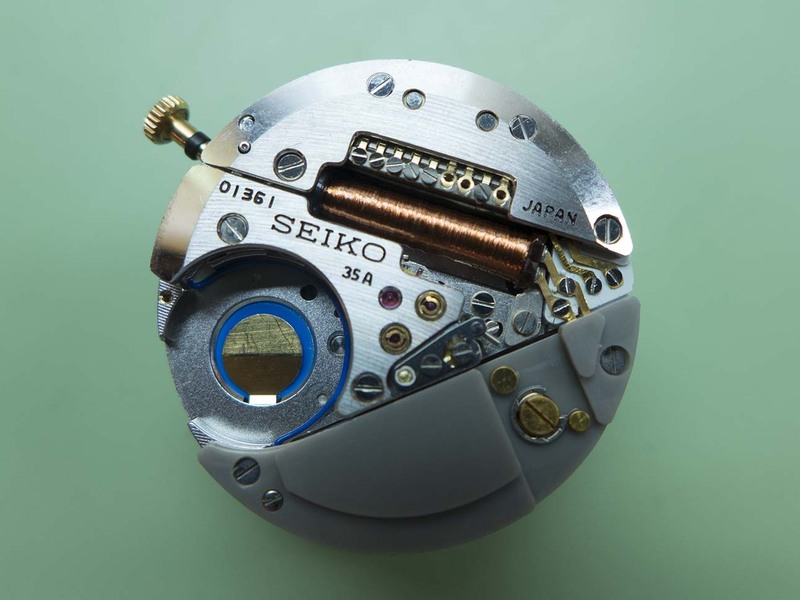 This was only possible because Seiko did not pursue monopolization on patent rights of those unique technologies and opened them up to all the world. 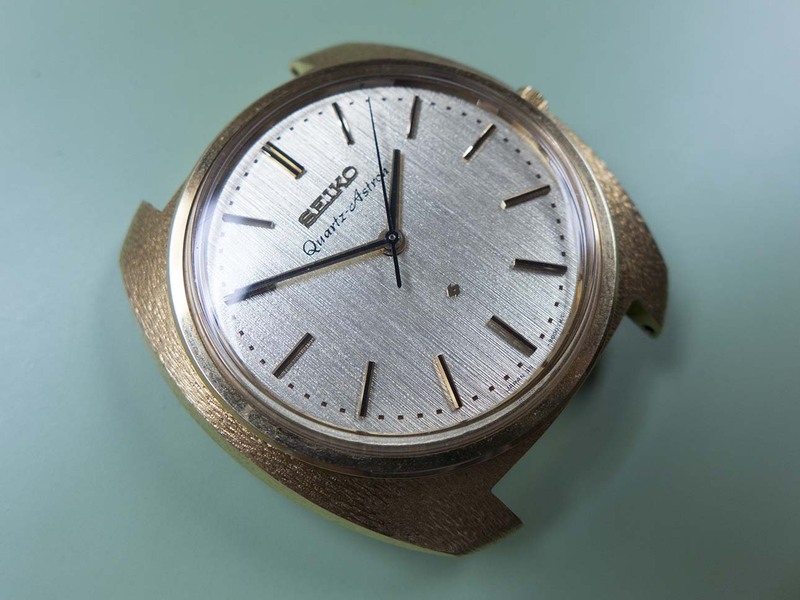 At the time of release the Astron cost 450,000 yen ($1,250) which at the time was equivalent to the price of a medium-sized car. 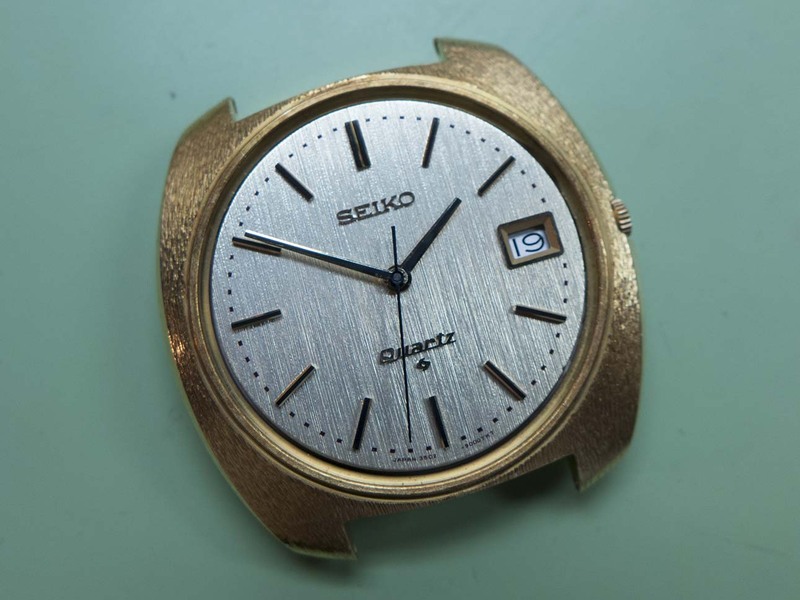 Even at this high price after the first week Seiko had sold 100 units. 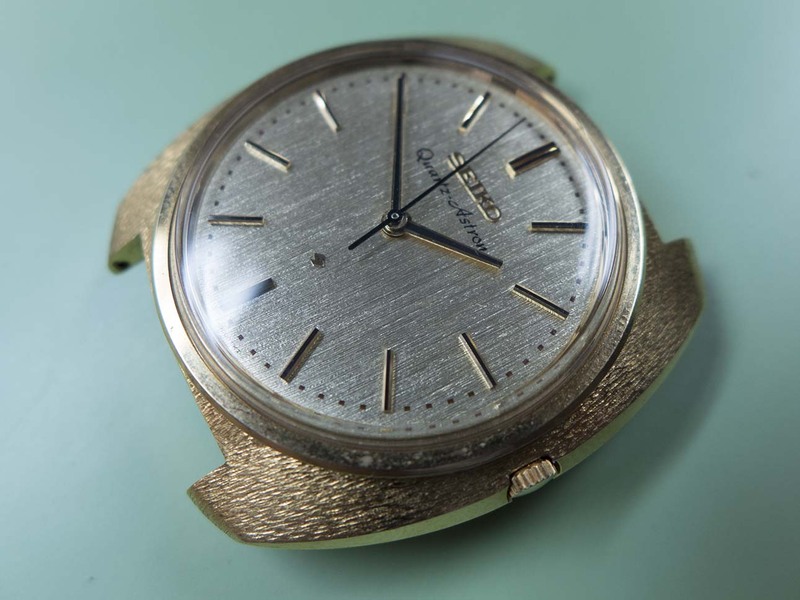 The case was made from 18k gold and had a distinctive textured finish, the dial also had a textured finish and the hands were of the simple baton/stick type. To get to work one one of these historical pieces is a joy but to get two in at the same time, one date and the other non date, really was an honour. 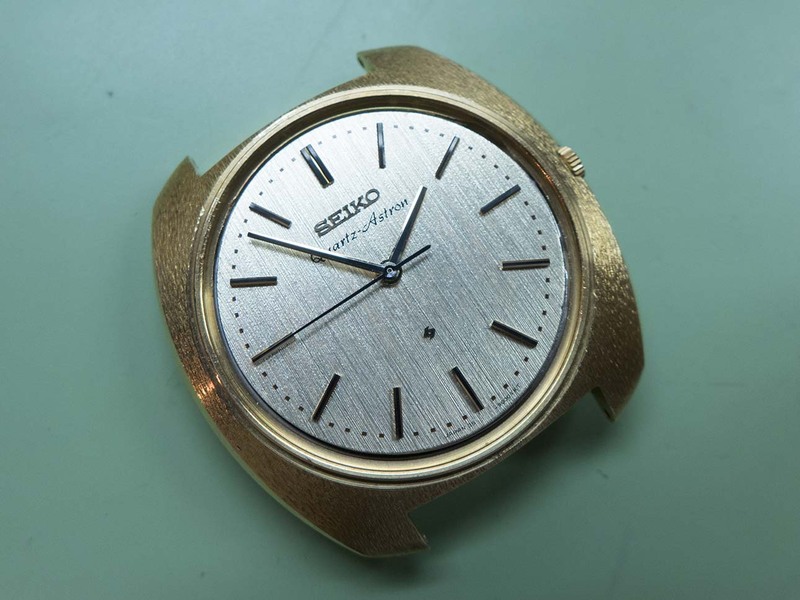 The owner is a huge Seiko collector with one of the most comprehensive collections of vintage Seikos on the planet. 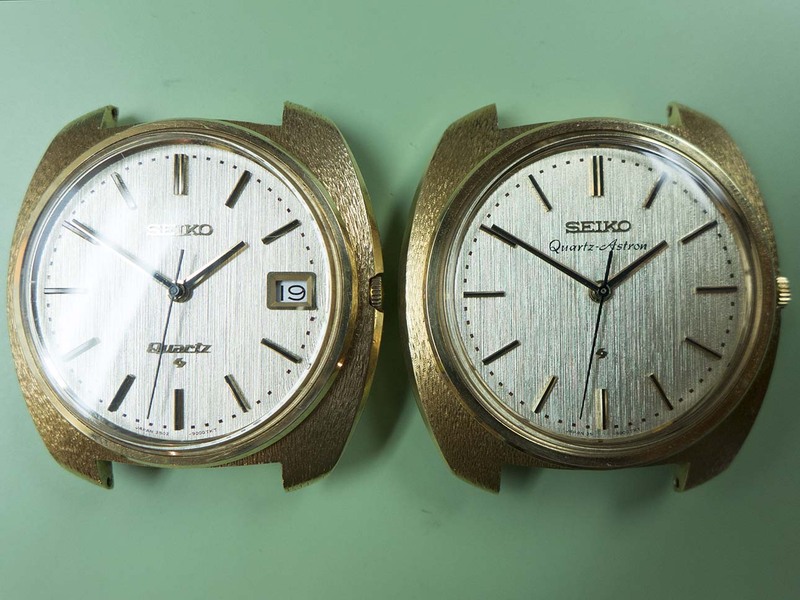 The watches came in with the non date version in a non running state and the date version running. 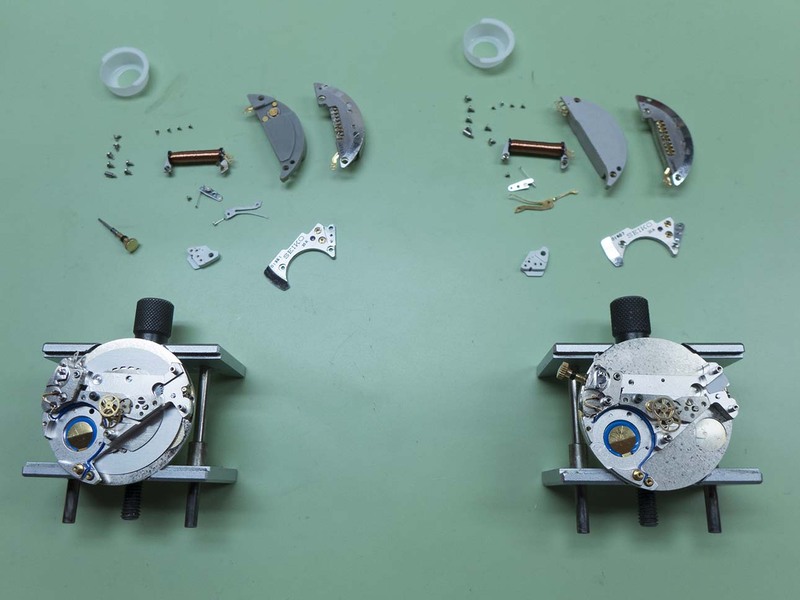 Both required servicing because there was no baseline established as the history of both pieces was unknown. Obviously we were hoping the non running examples problems were caused by either something mechanical or a dirty connection. Below is the quintessential no date Astron. And this one is the lesser seen example with the date. 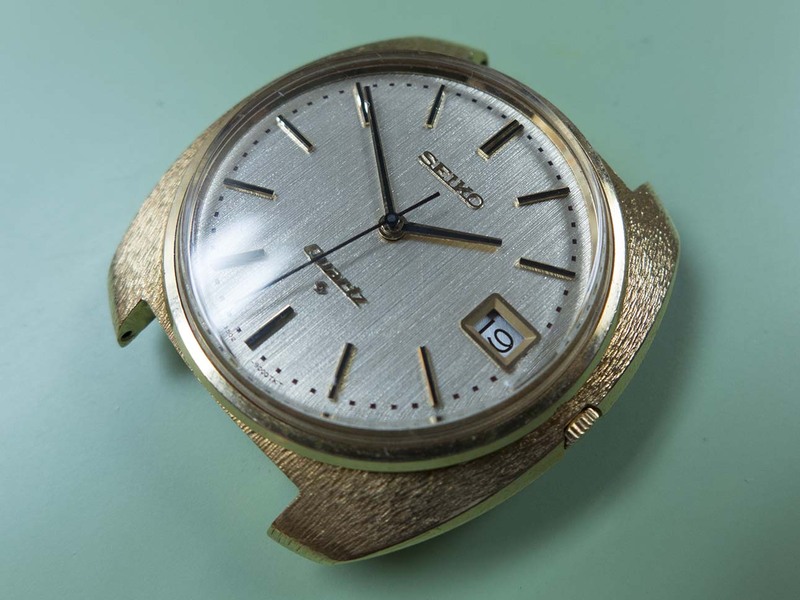 Starting with the non date watch, the case is a one piece affair with a hatch for the battery, as you can see this has a production date of April 1970. 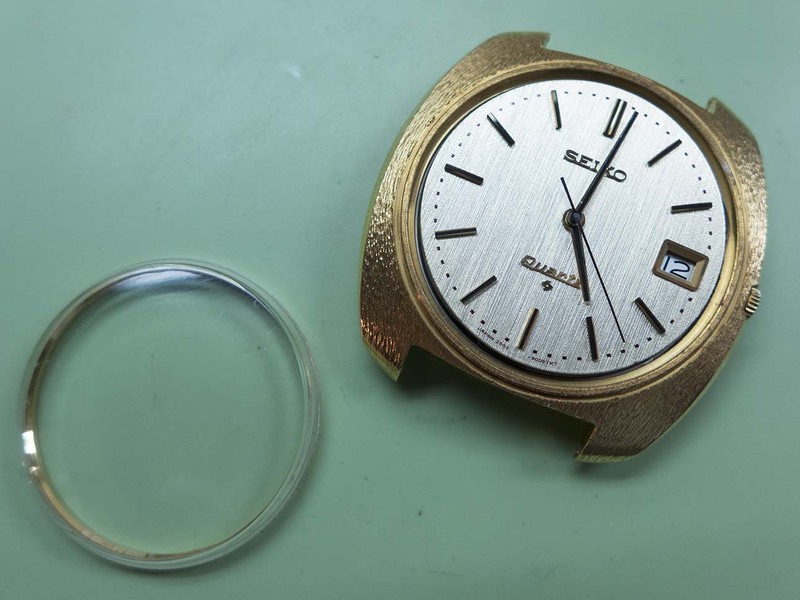 The movement has to be removed from the front so after removing the battery I removed the crystal. 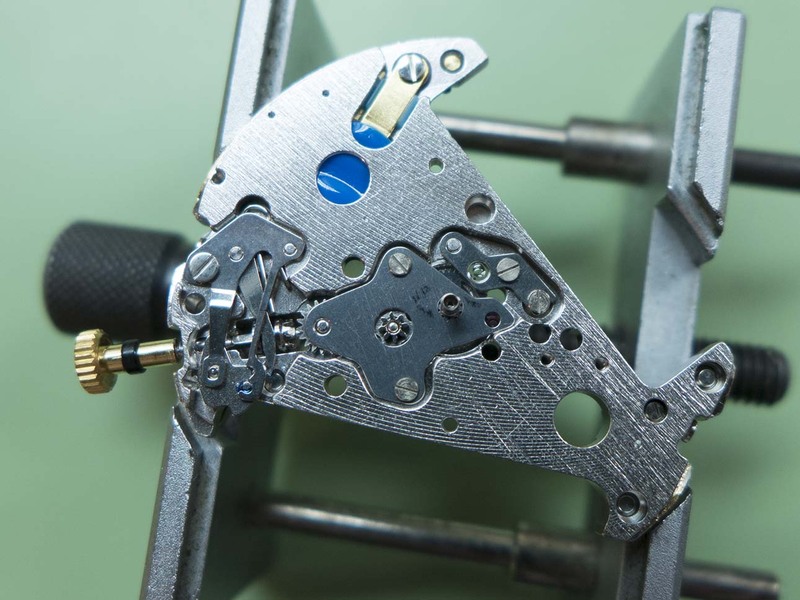 This exposes the stem release button and the movement circlip which has to be rotated anti clockwise slightly to allow the movement to be removed. The inside of the case has a steel shield fixed to the bottom. 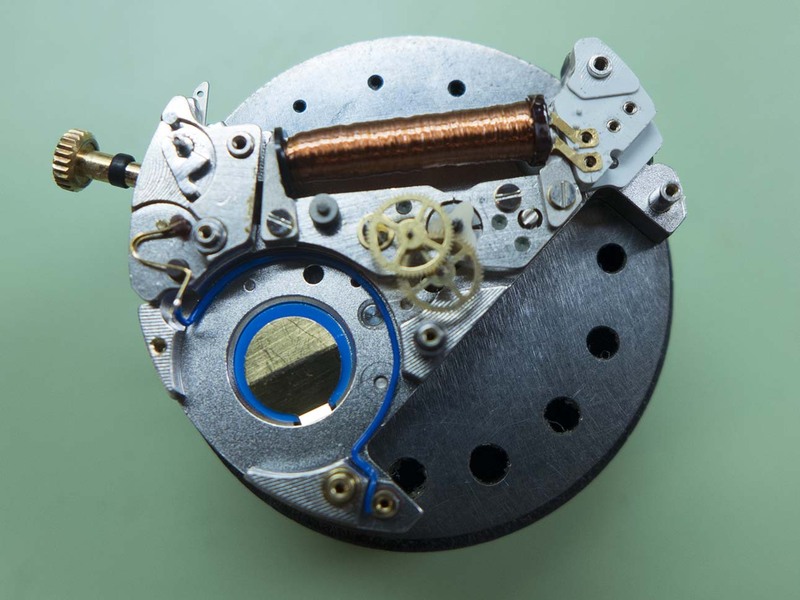 With the dial removed you can see the mainplate is shaped like a wedge of cheese to allow for the huge (by today’s standards) quartz oscillator and circuit block. The motion and keyless work are both a simple affair, although all the parts are pretty much unique to this calibre. 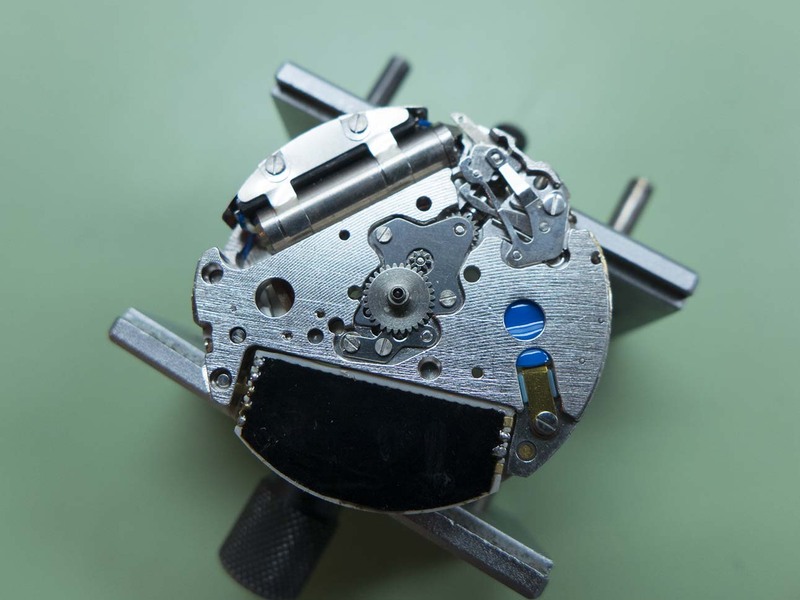 I turned the movement over to start with dismantling the other side. 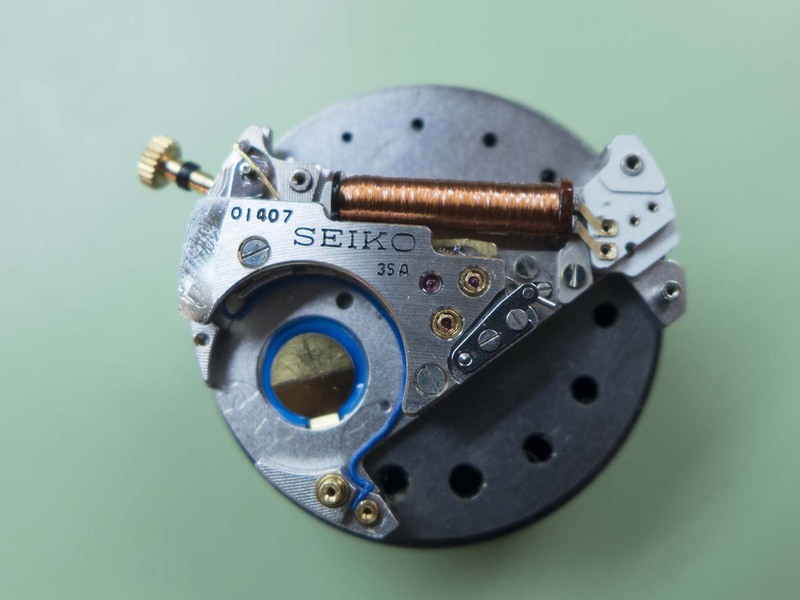 Note the order of the connection above the coil and the four connections to the right of it, why will become apparent later on. I’ve removed the plastic battery insulator and the IC block here. 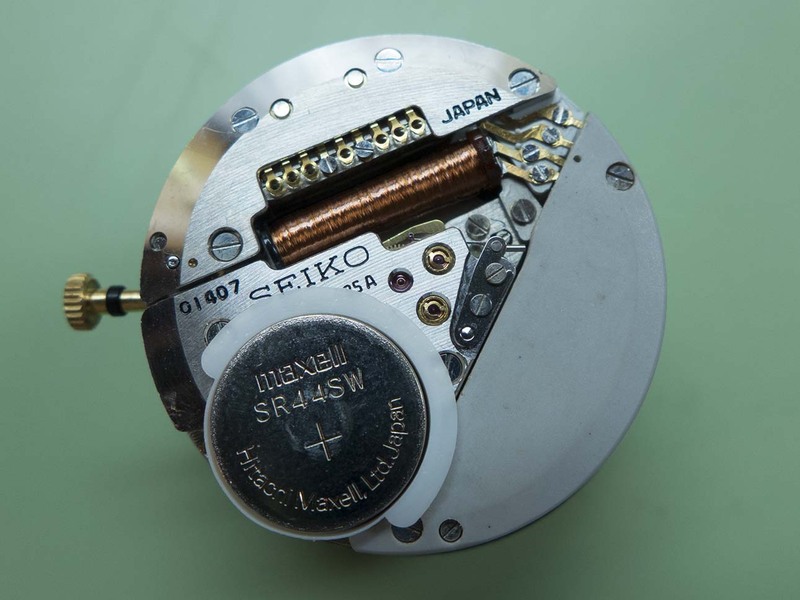 A feature you don’t see on todays quartz’s is a jewelled jumper to index the centre wheel, Seiko obviously didn’t want to rely on the step motor alone. 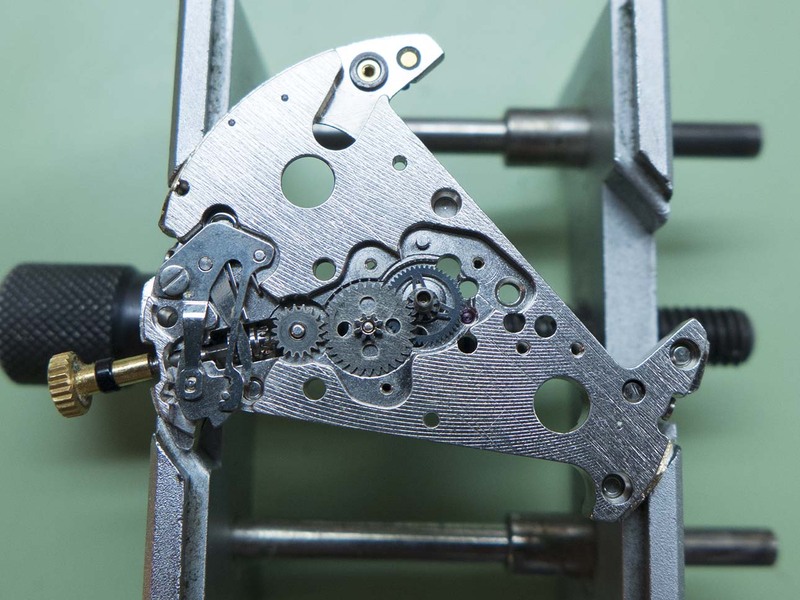 A benefit of this is the seconds hand will alway land bang on it’s marker when lined up correctly on re-assembly! 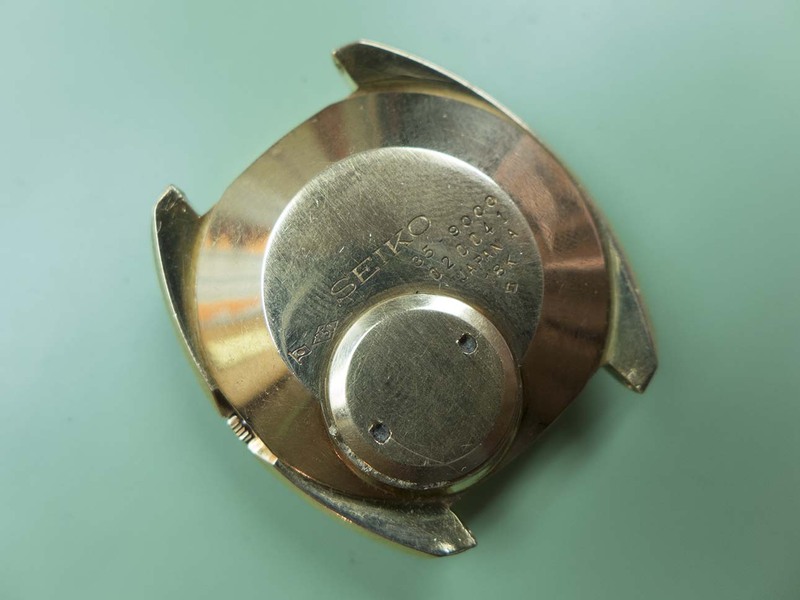 The pressure on the centre wheel can be increased or decreased by turning the eccentric screw (arrowed on the right). 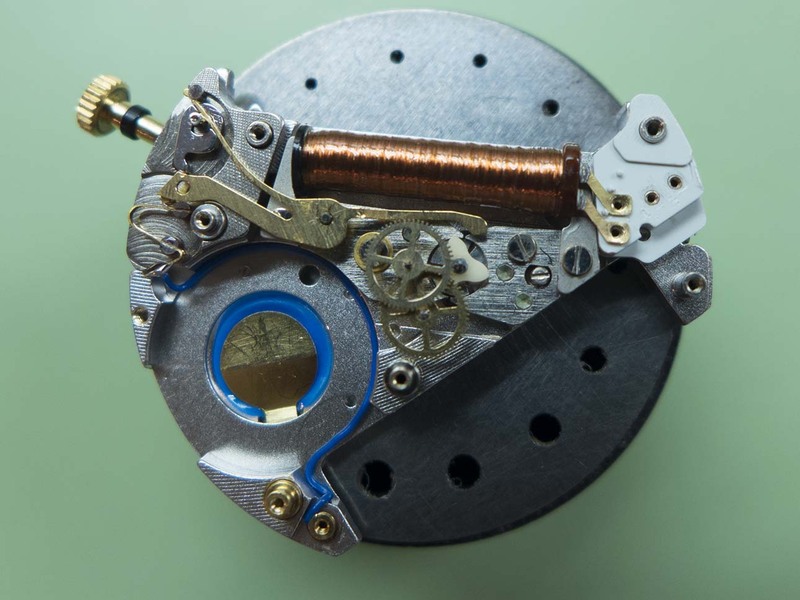 I’ve removed the quartz oscillator in this shot. I’ve removed the bridge in this photograh, one of the design shortcomings of the 35a is the train bridge needs to be removed before you can remove the coil. 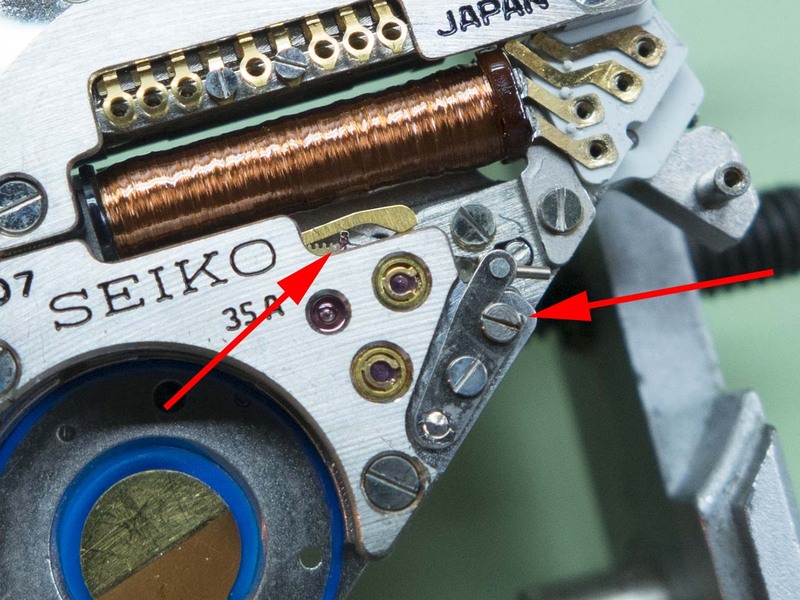 Note the long stop lever that acts directly on the step motor. And that’s as much as can be removed from the going train side. 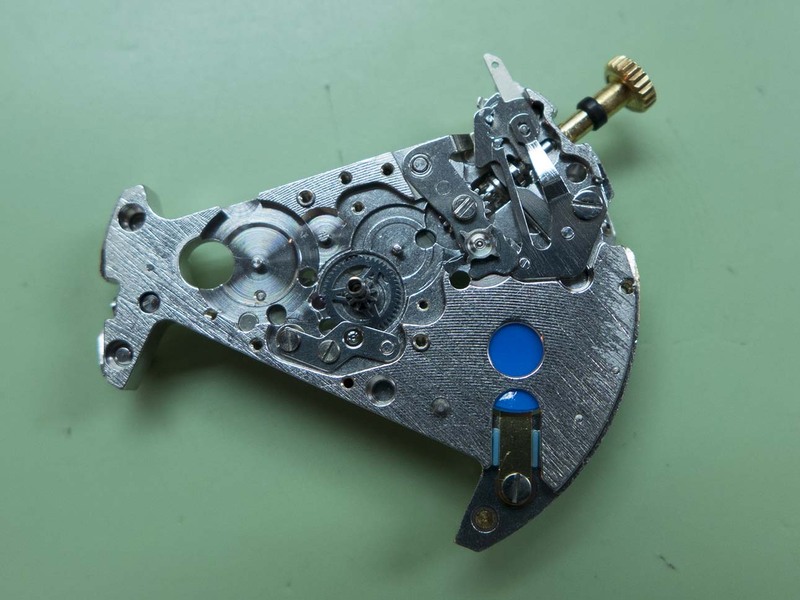 I once again turned the movement over and started on the motion work by removing the top plate which exposed the motion work. 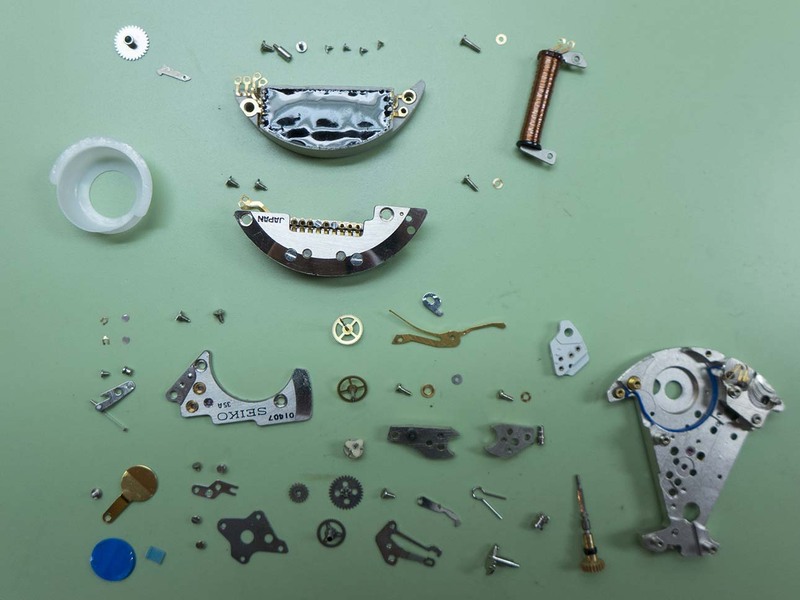 I’d soon dismantled the rest of the movement and it was now ready for the cleaning machine. 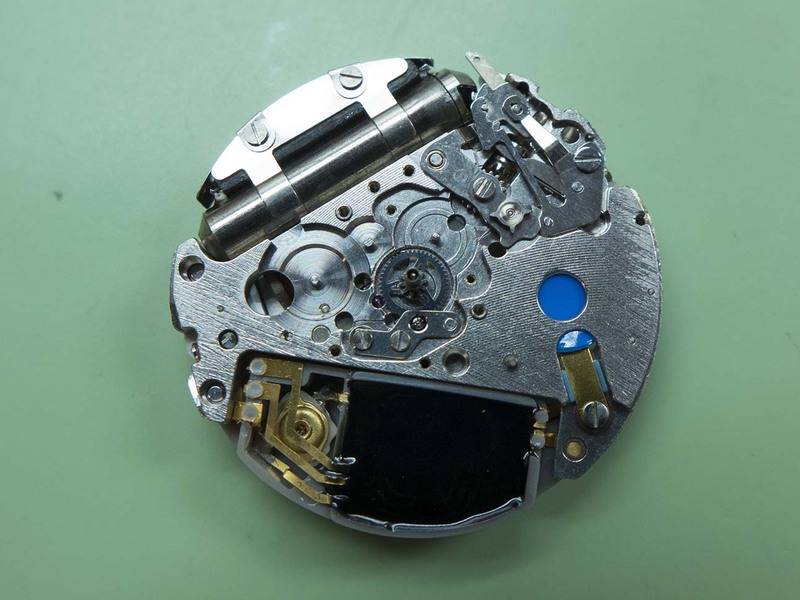 After cleaning I reassembled and lubricated the motion and keyless work. 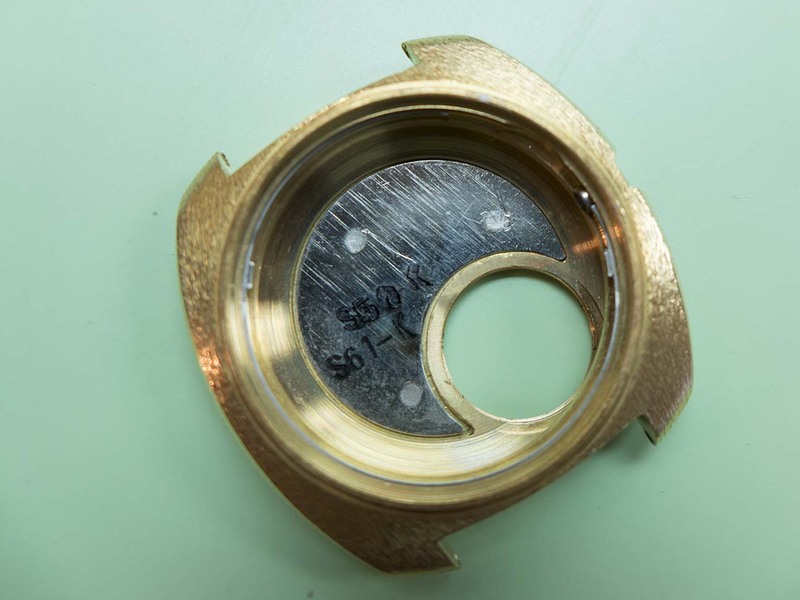 I then started on the other side, here the coil (which tested fine at 3.07kΩ), train and stop lever are fitted…. 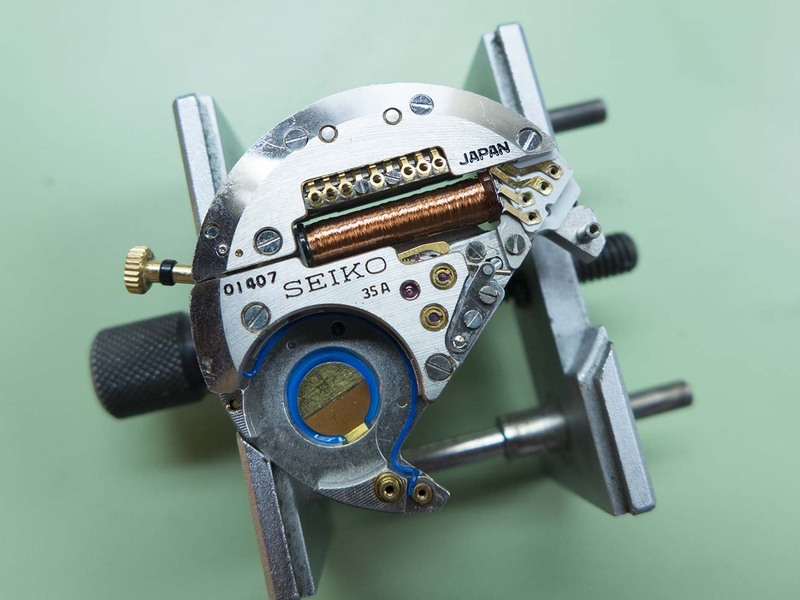 ….and here the bridge is back on and the jewel caps and springs are lubricated and fitted. 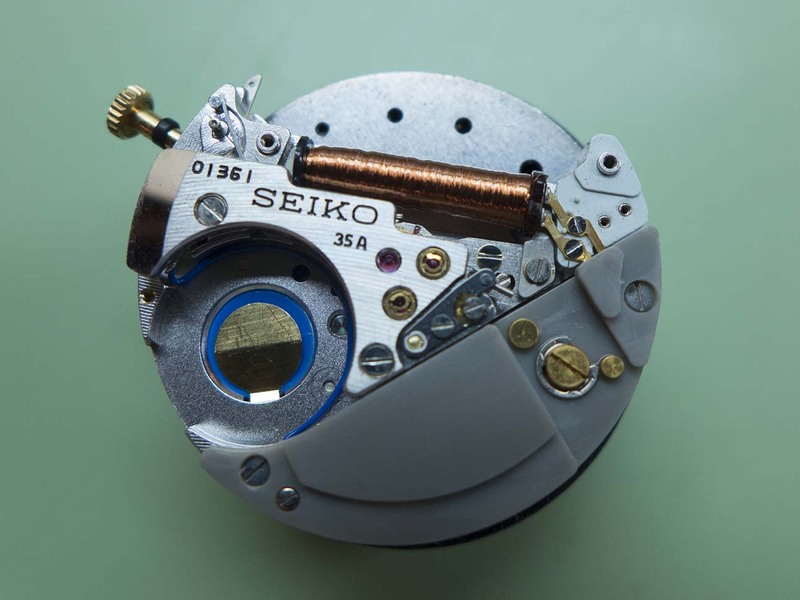 I’d refitted the circuit and quartz oscillator here. 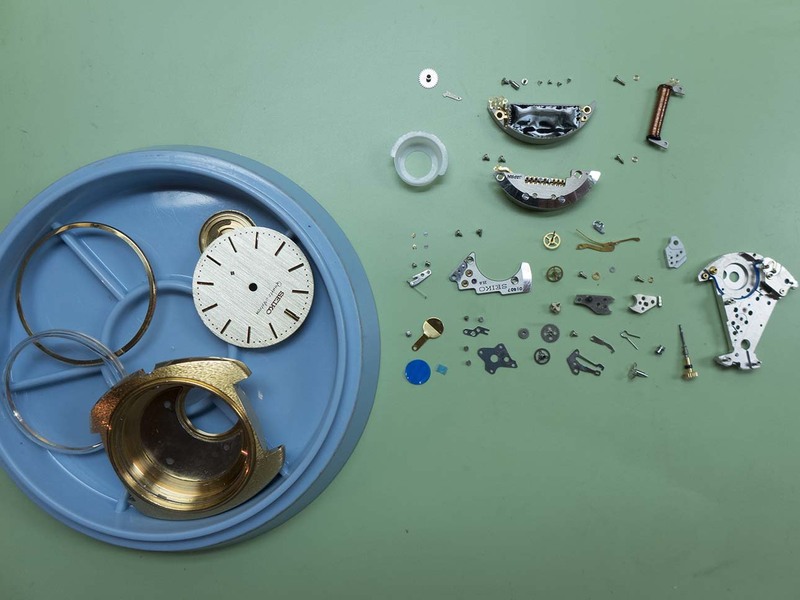 Despite cleaning all the contacts (which to be fair looked in good condition anyway) and servicing the mechanics, the current draw remained steady at 3.46µA. This was exactly what it was before I started, as mentioned the coil was healthy with a reading of 3.07kΩ. 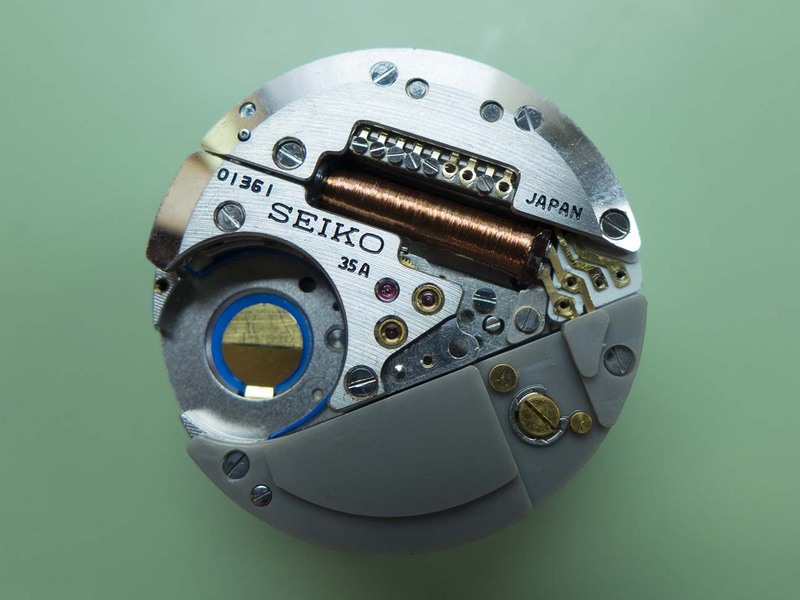 These are power hungry movements which draw about 7µA when running and this drops to about 2.5µA when hacked. The issue was obviously deeper seated than hoped for which means replacement parts will be required. 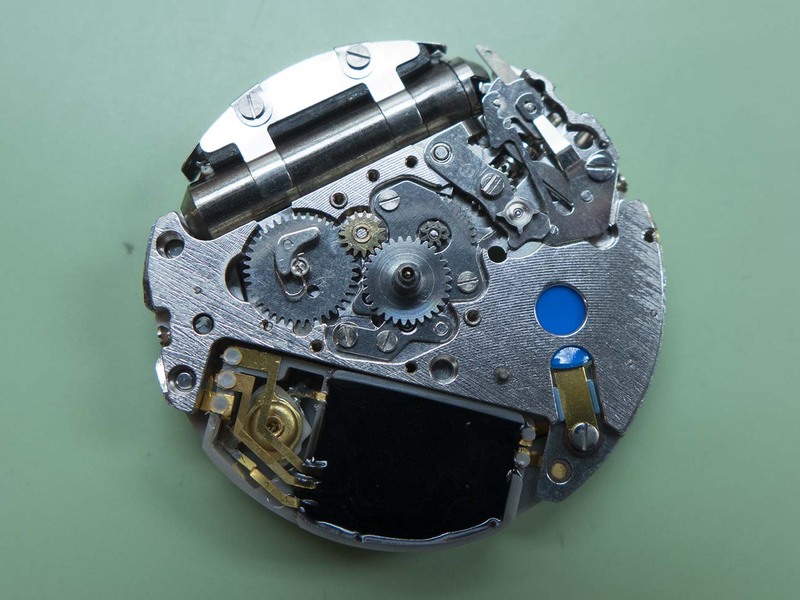 I left the watch with the movement removed and reported back to the owner with my findings. I then turned my attention to the date version. There are subtle differences between this and the none date apart from just the date window. 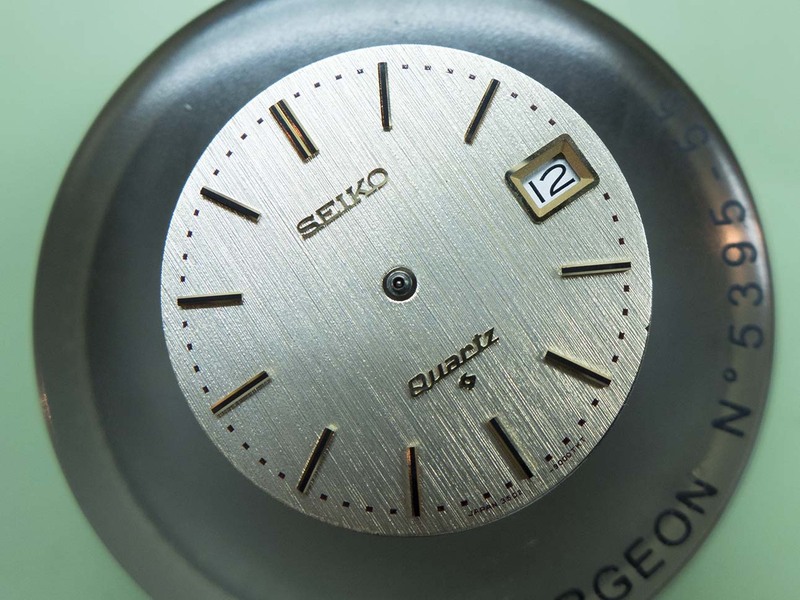 There is an applied “Quartz” logo in gold at the six o’clock position and the “Quartz Astron”script has disappeared from below the Seiko logo. The rear looks identical to it’s brother but this one has a slightly earlier production date of February 1970. 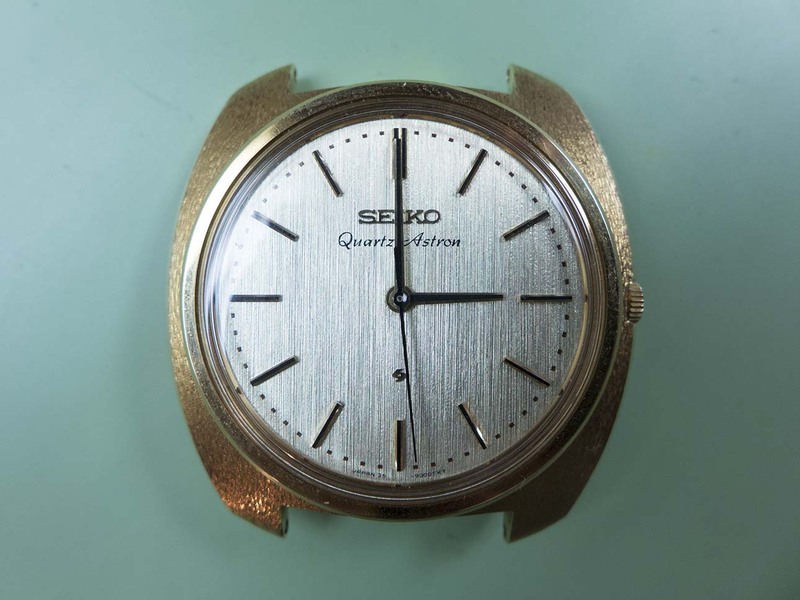 The movement is removed from the front just like the non date version. 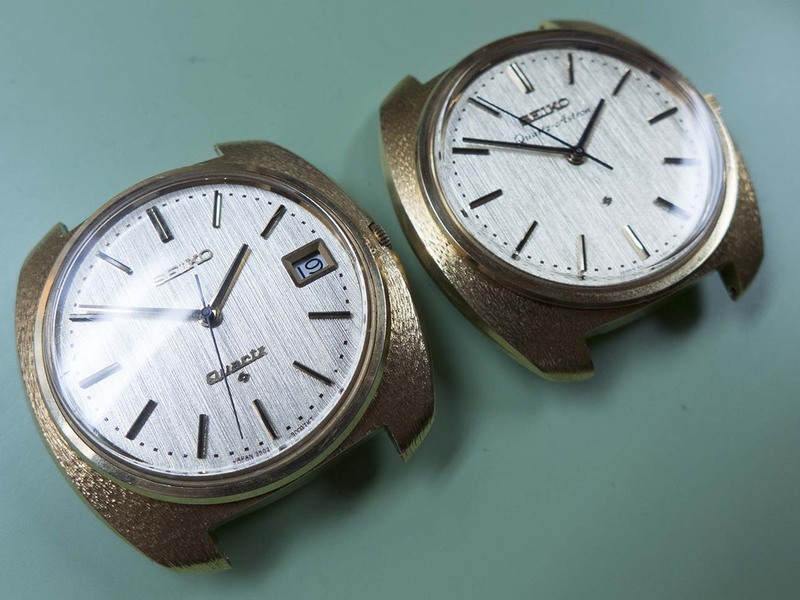 The case is actually identical to the non date version. I’ve removed the handset in this shot. 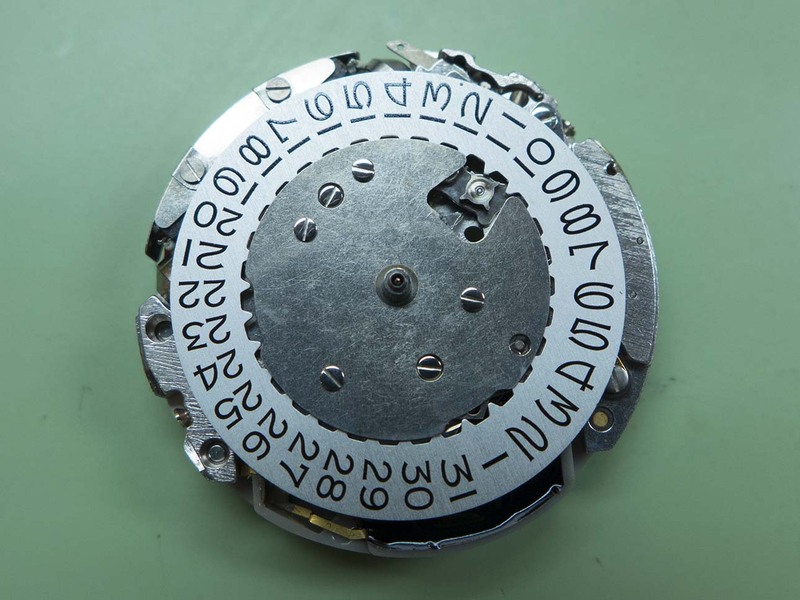 You can see the date disk with the dial removed. The font is identical to that used on the 62xx caliber movements with the distinctive curved diagonal on the “4”. 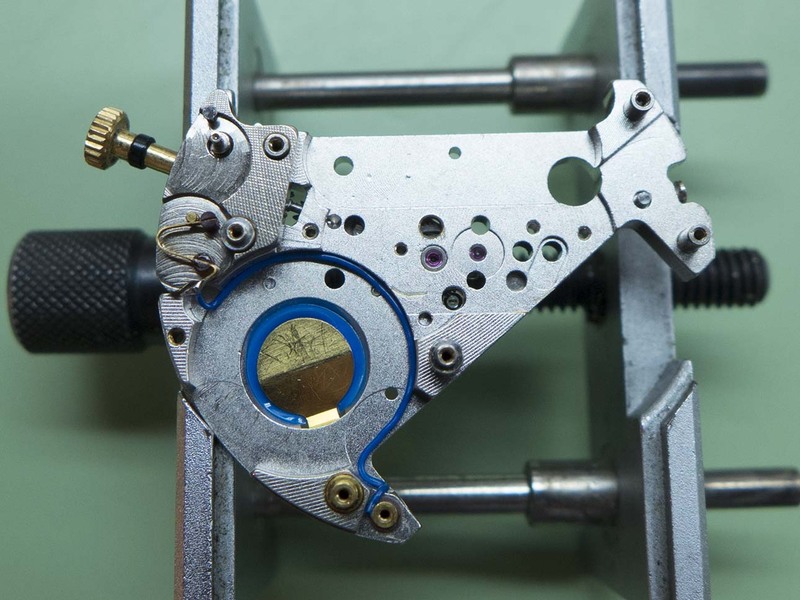 With the top plate removed I could remove the jumper and spring…. 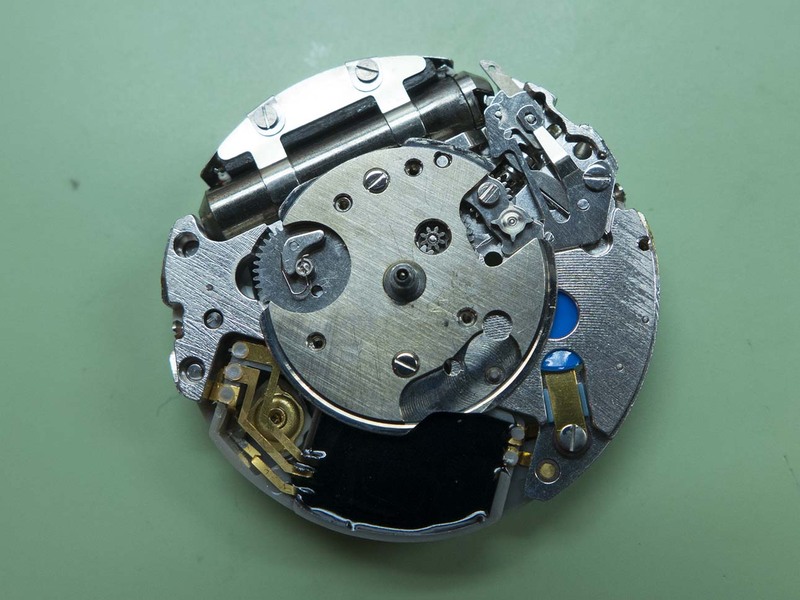 ….then remove the date disk. 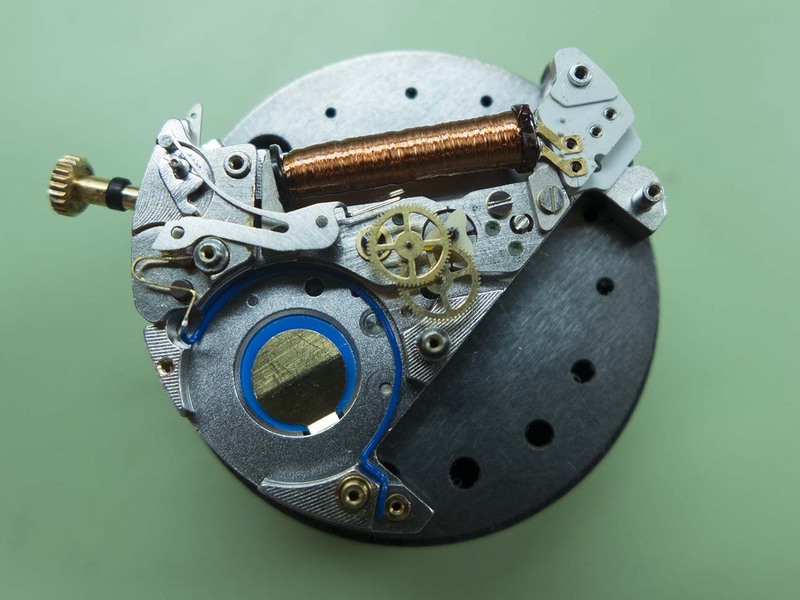 The differences between the IC blocks are apparent now, this earlier movement has a trimmer which is removed in the later ones. 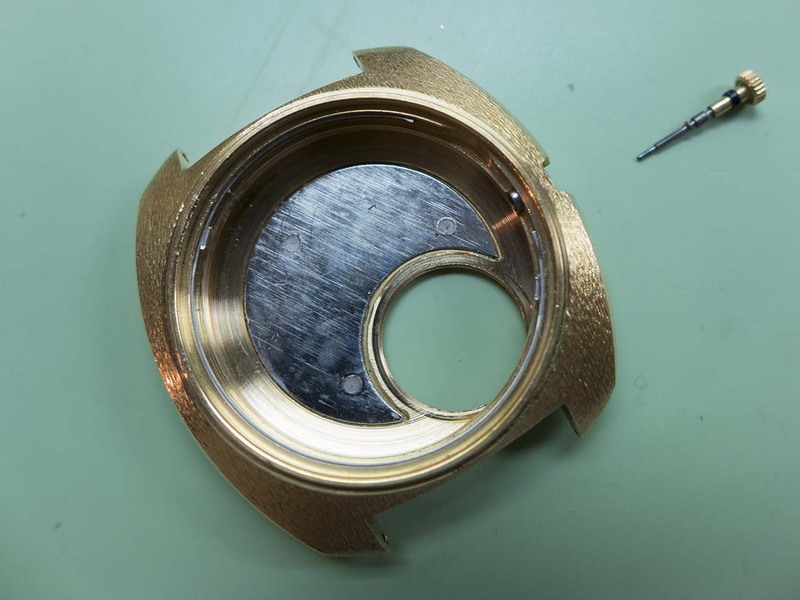 I then removed the bottom plate which give access to the motion and keyless work. 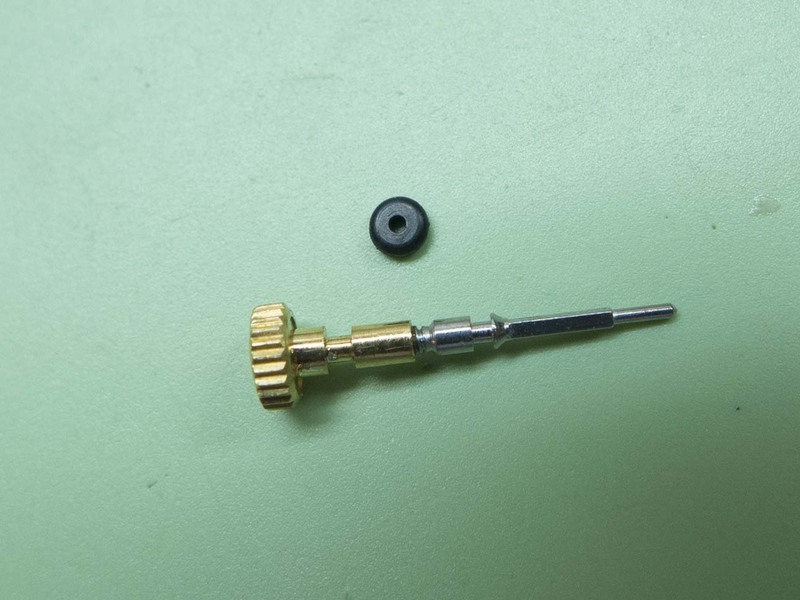 The canon pinion is the type that grips the wheel in three places, these are a good design but they can’t be tightened in the traditional way if they loosen off. 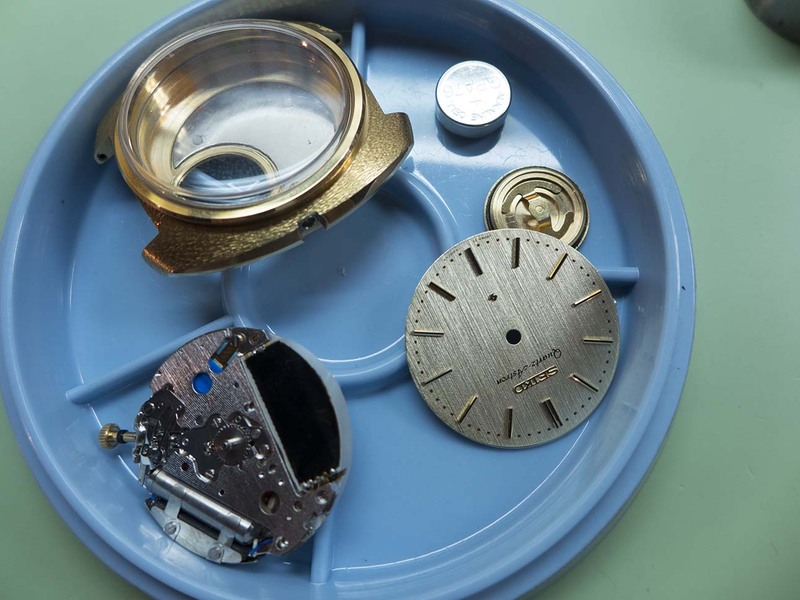 Once I’d finished stripping the dial side I flipped the movement over to start on the other. You can see the subtle differences between this earlier (by two months) example and the later one. 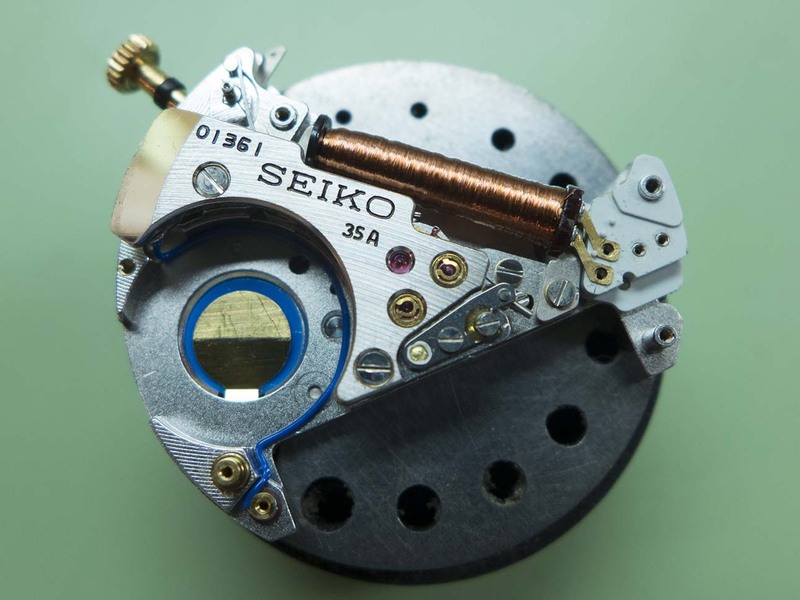 There are six connections on the quartz oscillator compared to two on the later one. 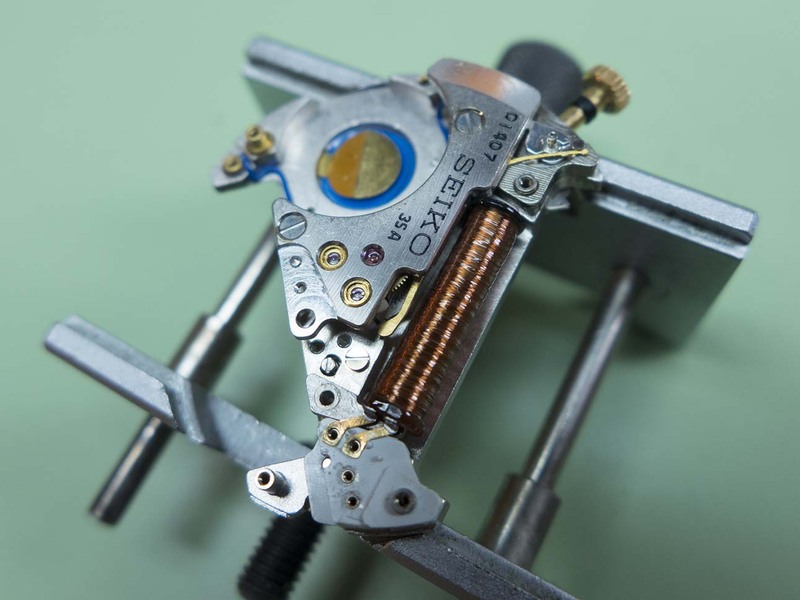 There are only two connections between the IC block and the quartz oscillator and the IC block has a trimming screw. 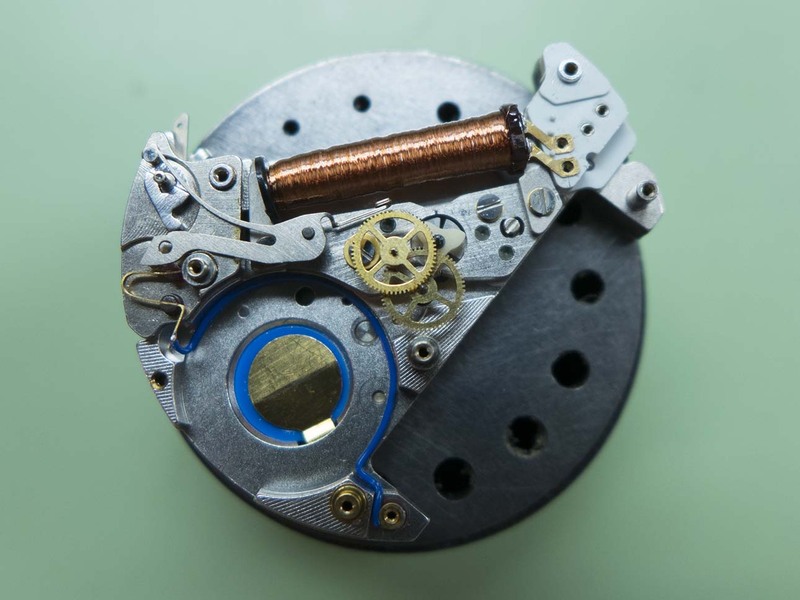 I’ve removed all the circuitry apart from the coil in this shot. The bridge is removed in this shot, not the different shaped stop lever which acts on the centre wheel instead of the step motor. 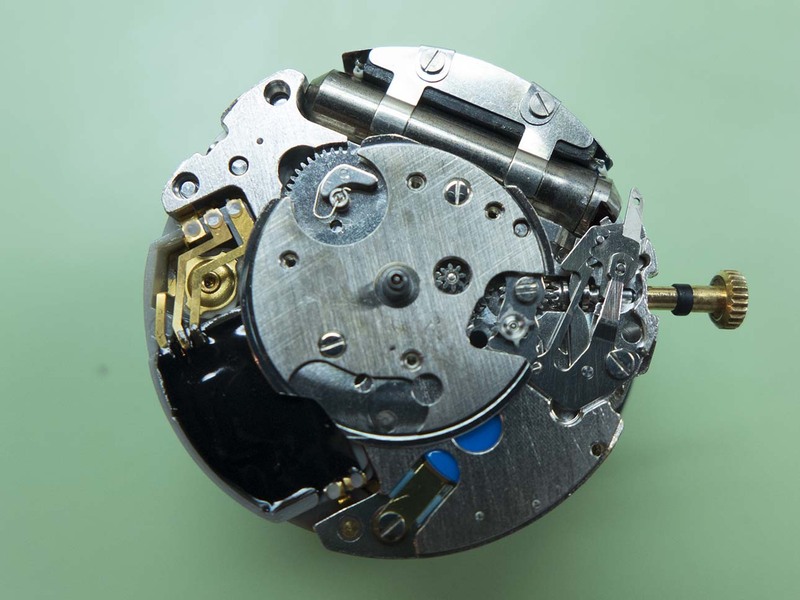 Once I’d completely stripped the movement it was ready for cleaning. The rebuild was basically the reverse of the stripdown, the keyless work and canon pinion are refitted first. 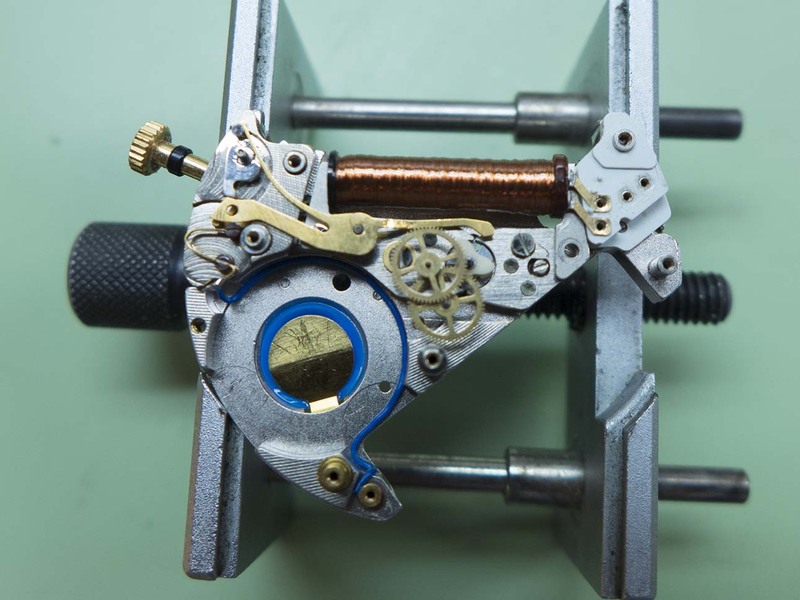 I then turned it over and fitted the going train and coil…. 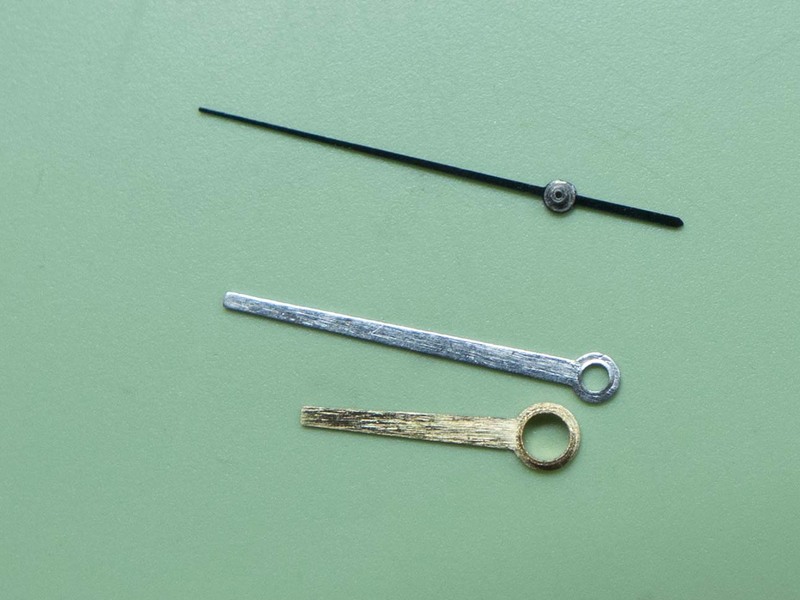 ….and the bridge, indexing arm, jewel caps and springs. 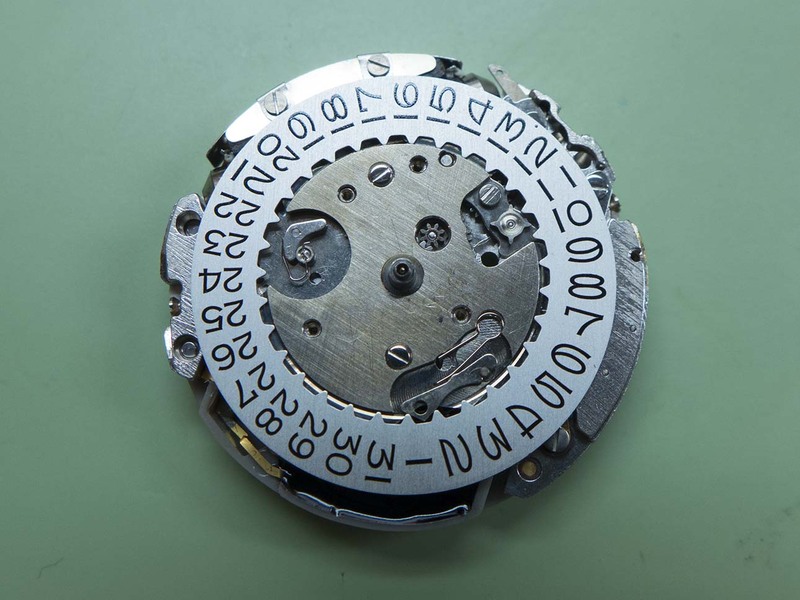 The IC block was next to be fitted…. 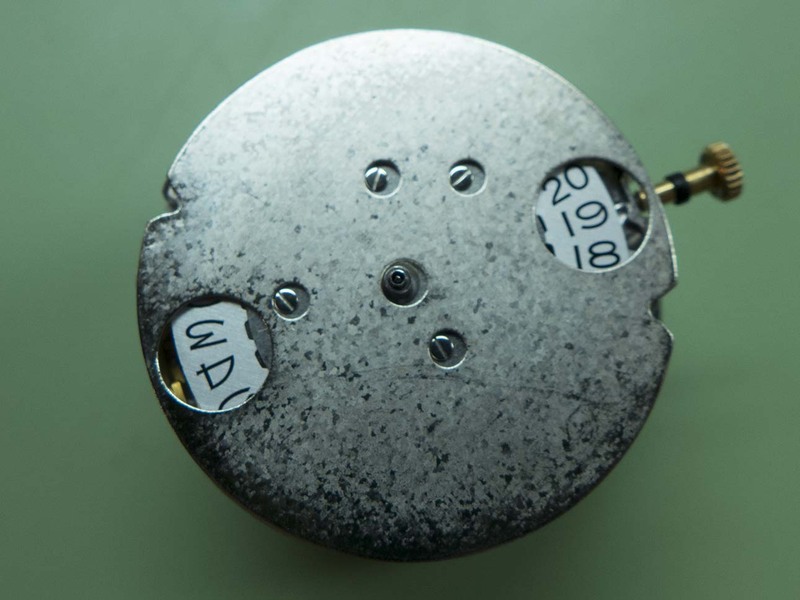 I turned it over again to complete the dial side, the calendar work is going together here. 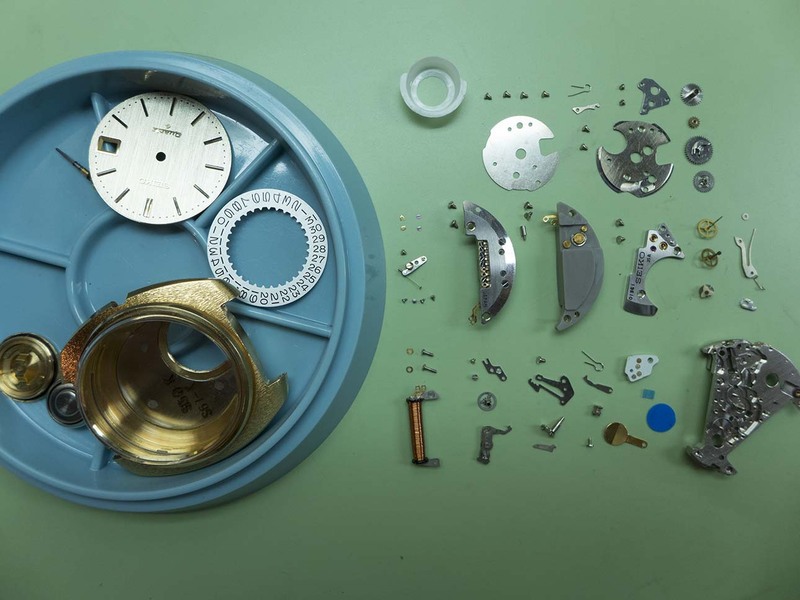 The plate you see here is sandwiched between the dial and the movement. I fitted the dial and handset next and waited for instructions as to what to do next from the owner. 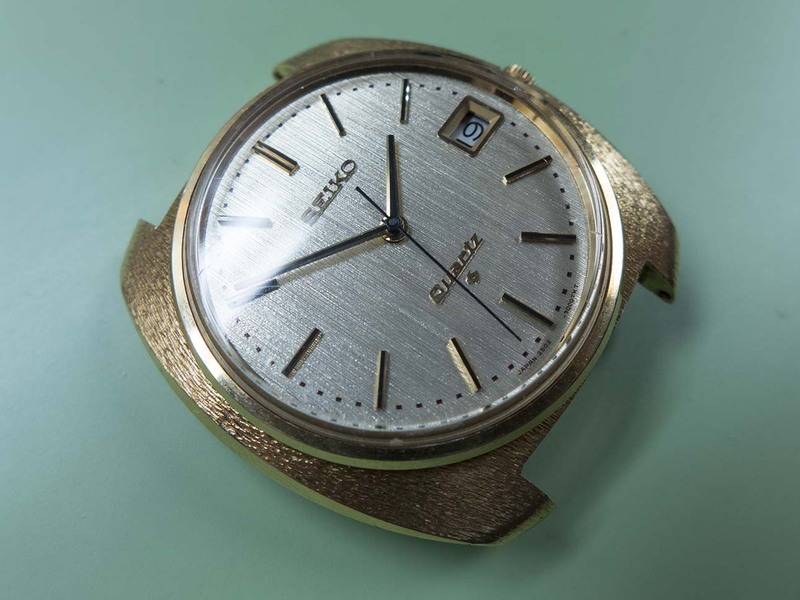 The conclusion (which I’m in total agreement with) was that he would prefer to see the non date example running as this one is the archetypal Astron, this will give him time to try and unearth some spares in order to get the both running again. 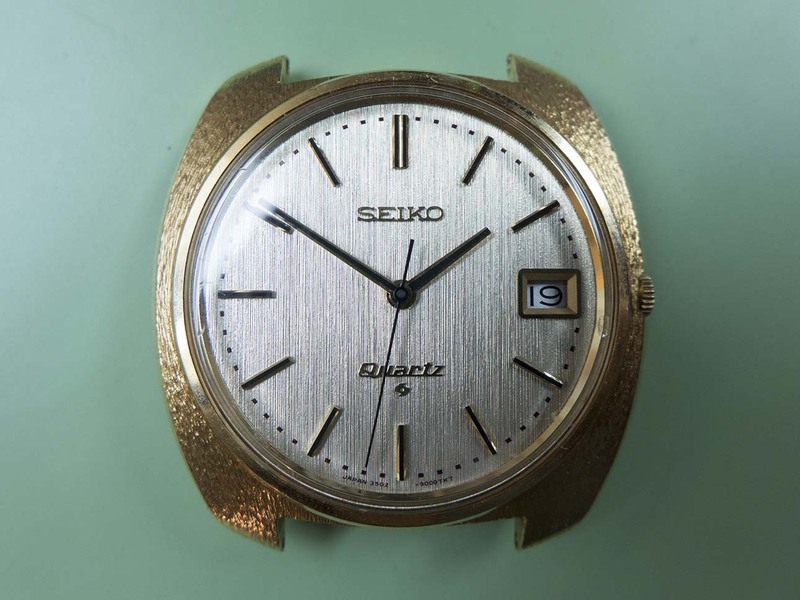 He’s currently in contact with Seiko to see if they can help with any leads, info or even better parts! This meant I needed to strip both movements of the circuitry and swap over the components. 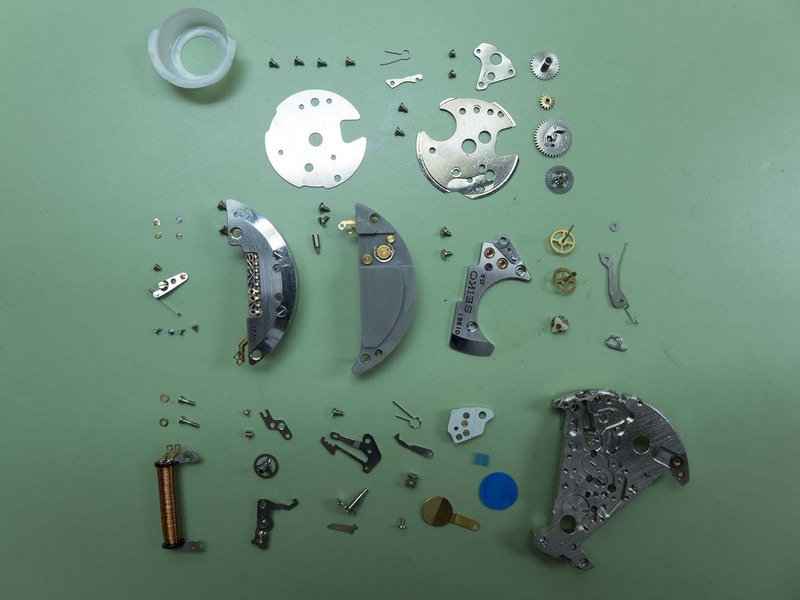 We agreed it would be best to swap everything from one to the other due to the differences in the connections and circuitry, as this included the coils it meant the bridges had to come off again. With the circuitry swapped and the movement replaced I fitted a new o-ring to the stem before replacing it. 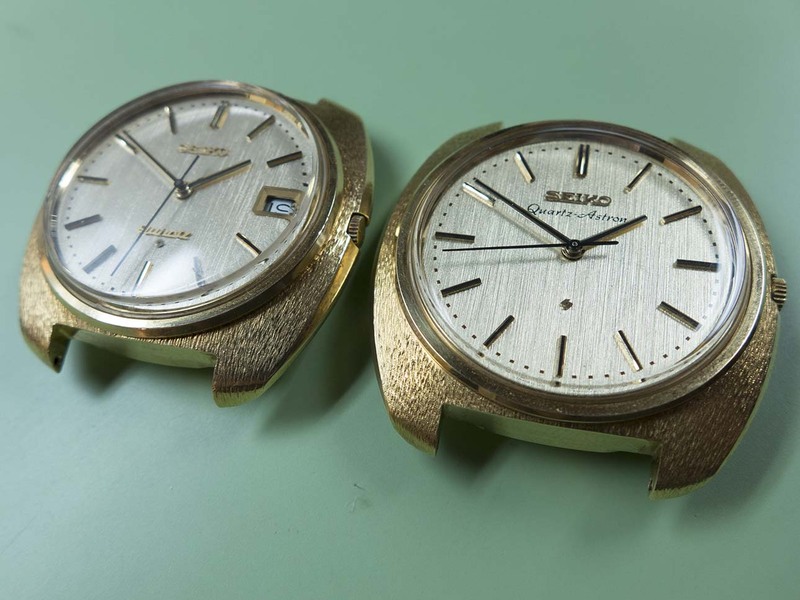 Interestingly although the hour and minute hands are gold when viewed from above, the hour is gold and the minute is silver when viewed from below, this is the same on both models. 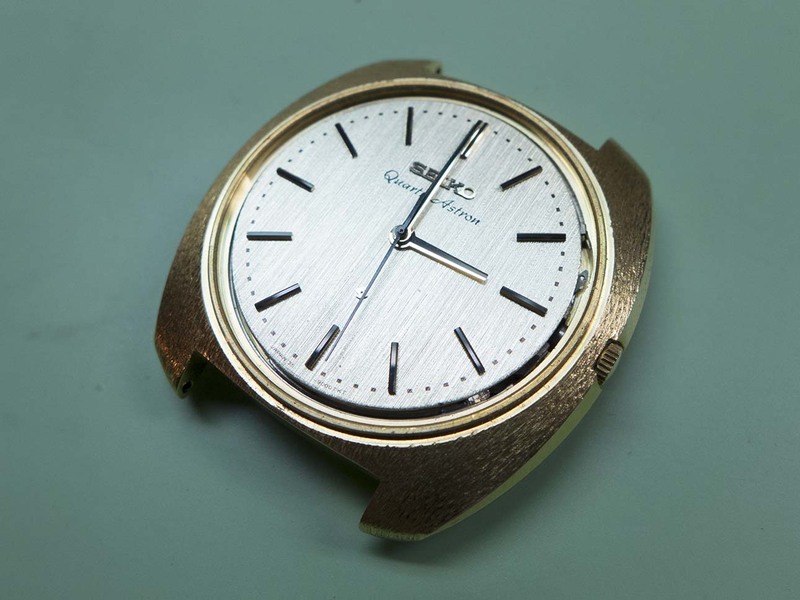 The running movement was refitted to the non date case…. ….which meant this one was back up and running. 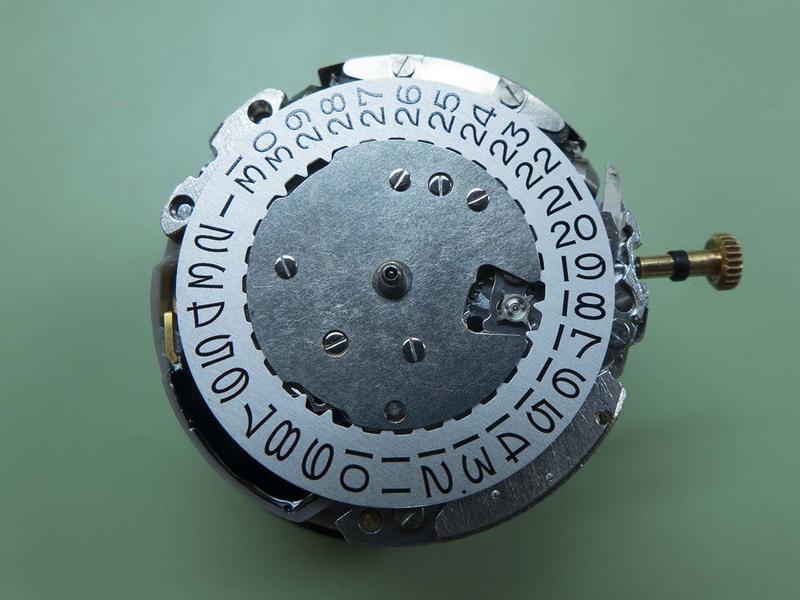 I also reassembled the date model to keep everything together. Here’s a few shots of them together for the archives. Once we have the parts the date version will be brought back to life! As I said at the beginning of this post it’s an absolute pleasure for me to be able to get up close and personal with important pieces like these. What a wonderful post and a pleasure to read, thanks for sharing!